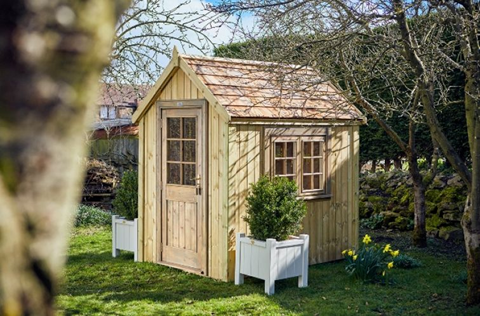 Gardeners looking for a beautiful, classic shed which can be customised to suit any outdoor space needn’t look any further than the new Potting Shed, from The Posh Shed Company. Due to its spacious design, it can be used to house potting benches and planters, or simply used as an area to have a break after a busy day in the garden. Available in five sizes, 6×4, 7×5, 8×6, 9×7 and 10×8, there is also ample space for garden machinery, tools or growing bags. The Potting Shed has a steep pitched roof with a generous overhang which, along with the small pane windows gives it a traditional look which will blend into any garden. Gardeners can customise their shed using a 3D online visualiser, which can be found on The Posh Shed Company website. Furniture colours, size of windows and glazing options are just some of the many features which can be edited. Flexibility is at the forefront of the Potting Shed design as it comes in three build options, three roof options and seven different colours. The three build options, unique to The Posh Shed Company, include Posh, in which the shed is supplied pressure treated and is ready for self-assembly. If gardeners choose to go with the Very Posh option, the shed will come painted, delivered and installed or if they upgrade to Unbelievably Posh, it will be the ultimate in build quality and features. Prices for The Posh Potting Shed start from £1,757 – price for delivery and installation starts from £695. Prices for The Very Posh Potting Shed start from, £3,322 – prices include delivery and installation. Prices for The Unbelievably Posh Potting Shed start from, £5,764 – prices include delivery and installation.